The Kennedy Silver Half Dollar refers to half dollar coins struck by the United States Mint from 1964-1970, however only the 1964-minted coins were composed of 90% silver. That specific year’s strikes each contained .36169 ounces of the precious metal. Beginning in 1965 and lasting through 1970, the US Mint produced Kennedy Silver Half Dollars from a 40% silver composition that contained .1479 ounces of pure silver per coin. Subsequent year’s circulation quality Kennedy Half Dollars are struck from a clad composition which contains no silver. 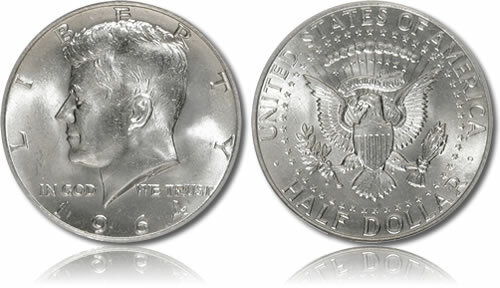 When first issued, the Kennedy Silver Half Dollars replaced the Franklin Half Dollars which had only debuted in 1948. Typically, the Franklins would have been struck another ten years before a new design would have replaced it. But the assassination of President John F. Kennedy in 1963 prompted Congress to demand the change a decade early and resulted in these half dollars appearing within only three months of Kennedy’s death. The obverse of the Kennedy Half Dollar shows a left facing portrait of the 35th President of the United States. The portrait was completed by former chief engraver of the United States Mint Gilroy Roberts who based it on the Kennedy Inaugural Medal he had designed two years earlier. Surrounding the portrait are the inscriptions of LIBERTY, IN GOD WE TRUST and the year. 1968-present Kennedy Half Dollars show the mintmark on the obverse right above the date. For the reverse of the Kennedy Silver Half Dollar, the presidential coat of arms is shown, as designed by chief engraver of the Mint Frank Gasparro. Surrounding the design which includes an eagle are the inscriptions of UNITED STATES OF AMERICA and HALF DOLLAR. 1964-dated half dollar mintmarks were located to the bottom left of the coat of arms.